Second Place, Political Plays, Seattle New Plays Buffet. In 1912, Jane Addams was witness to a strange phenomenon, as thousands of immigrants flocked to Hull House in response to the rumor that there was a “Devil Baby” there. 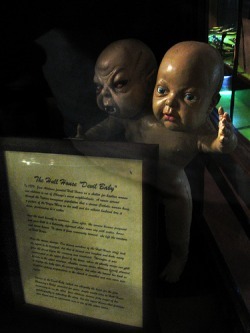 The Devil Baby was supposedly an infant with hooves, horns, and tail. According to folk myths, this incarnation of the devil was the result of a drunken husband’s curse that he’d rather see a devil in the house than another baby. In this one-act, Jane confronts an elderly Irish woman who has broken into Hull House with the single-minded intention of gaining access to the Devil Baby. The woman is not to be deterred, and Jane matches wits with her in her attempt to find an explanation for this strange obsession which seems to have taken possession of half Chicago. A radical confrontation between the sensibilities of a nineteenth century emigrant wife and mother, and a modern American lesbian of independent means.